Join us May 6th from 10 am - 12 noon for the May Support Group. Our featured speaker is Dr. Sinha. 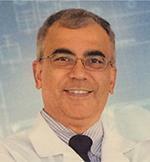 Dr. Uttam K. Sinha graduated with distinction from the Calcutta University, India in 1985. He was invited by the House Ear Institute and University of Southern California where he started his research career in molecular biology of neuroscience and cancer. He then finished residency in Otolaryngology-Head and Neck Surgery at USC and joined the faculty of the Department of Otolaryngology-Head and Neck Surgery. Because of his academic achievements, leadership, teaching and research, he became Chief and Residency Program Director for the department. By using nanotechnology, Dr. Sinha and his team are able to detect cancer cell in the saliva and serum - they are also studying the mechanism of metastasis. With Dysphagia (difficulty in swallowing) being a common symptom following head and neck cancer therapy, Dr. Sinha and his team introduced a novel treatment called Neuromuscular Electrical Stimulation (NMES) for rehabilitation of swallowing. His dedication to patient care and research made him world authority in head and neck diseases. Can't Make The Meeting In Person?